suite focused on extending the community. system and a chat room and friends system. 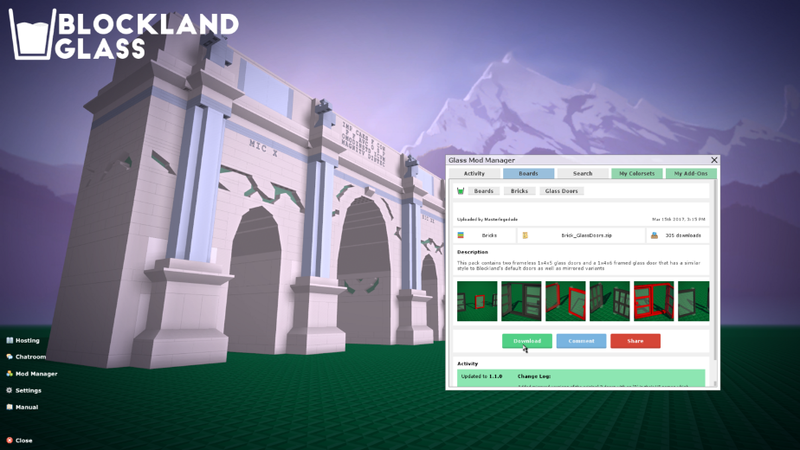 The Mod Manager allows you to browse, search, and install add-ons without ever exiting Blockland. You’re able to access all add-ons upload directly to Glass, as well as search and download add-ons from the RTB 4 Archive. The Mod Manager also ensures that all of your add-ons are kept up to date, thanks to Support_Updater, and import your old RTB add-ons to be updated to the latest version. We’ve implemented our own preferences system to make up for the loss of RTB preferences. All RTB preferences are automatically imported and available to control, along with some new preference types and optionsrticular. 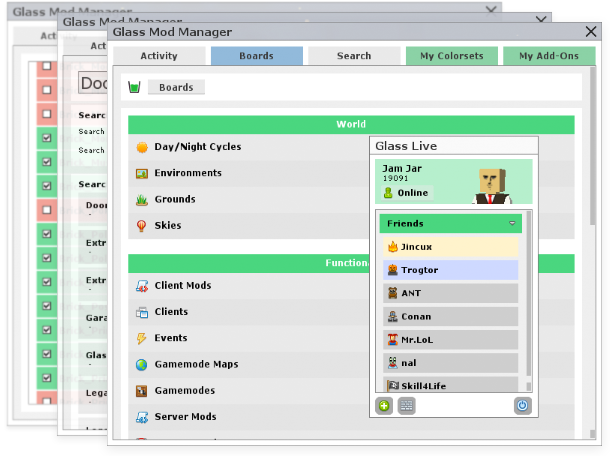 Glass enables you to preview servers before you join them, viewing the server’s preview image and player list. 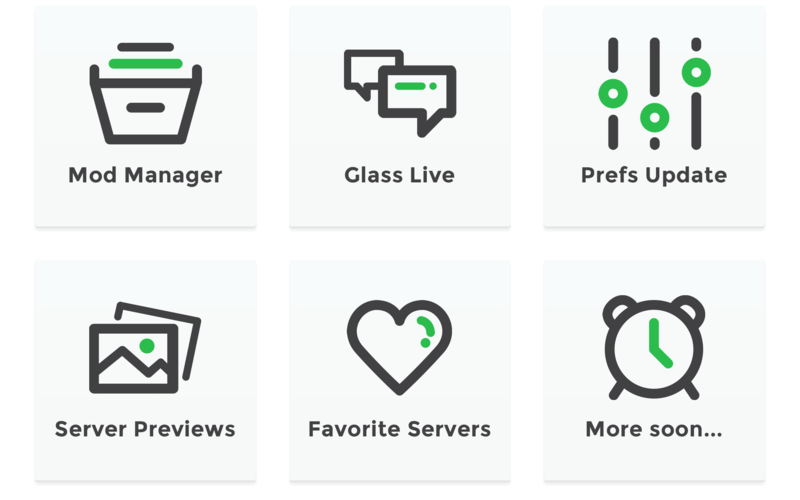 On top of that, we allow you to mark favorite servers, giving you notifications about the server’s status and allowing you to view and join it from the main menu. 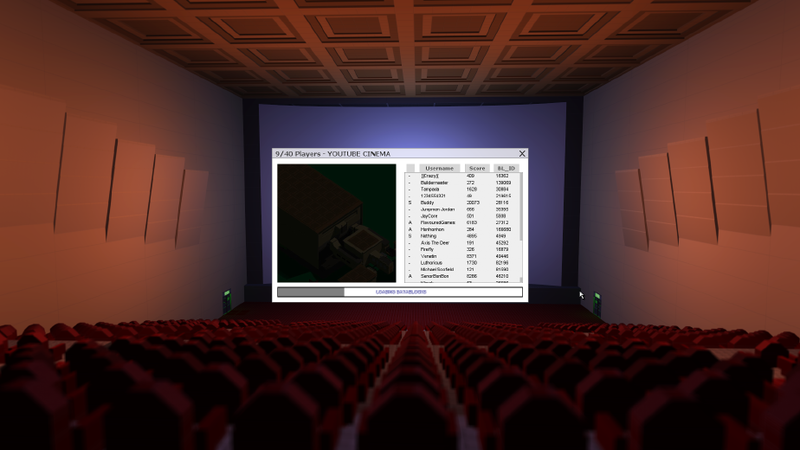 Glass also allows servers to have their own custom loading screen images, similar to how maps images worked before shadows and shaders. The project is forever growing with new ideas and features being developed and tested all the time. If you have a suggestion, we invite you to join in the conversation here on the forums! We would also like to give notable mentions for their contributions to McTwist and Greek2Me. Also, thanks to Mr.LoL for in-game photo assets. As a team, moving forward we would like to be more open with development and discussion of Glass. We plan to do this by keeping you up to date on what's happening and posting on our website and thread as regularly as we can. Your feedback is vital to helping improve the service as best we can! The Creators Update is a focus on adding new features for content creators to help manage and test their work using new bug reporting and crash detecting tools. Alongside this, there has been a big overhaul of Glass Live and the system's stability and reliability along with a handful of neat little tweaks and features added into the mix. See below for further details. about time one of these things replace RTB's old system. you need some moderators to make sure addons go in the right place; a destructo wand keybind isnt a weapon nor a tool; it should go in a client mod section. Although you reduce some work by letting modders pick a place for the mods to to, you shouldnt display them till youve actually looked at them; it doesnt have to be as rigorous as rtb but at least have a visual check that the mod is placed in the right category and has all the necessary files. So I can use this for my vehicles, and whenever they need updates, I can find a way to update the old to new? If that's the case, will Blockland Glass be a requirement addon? Or just recommended? 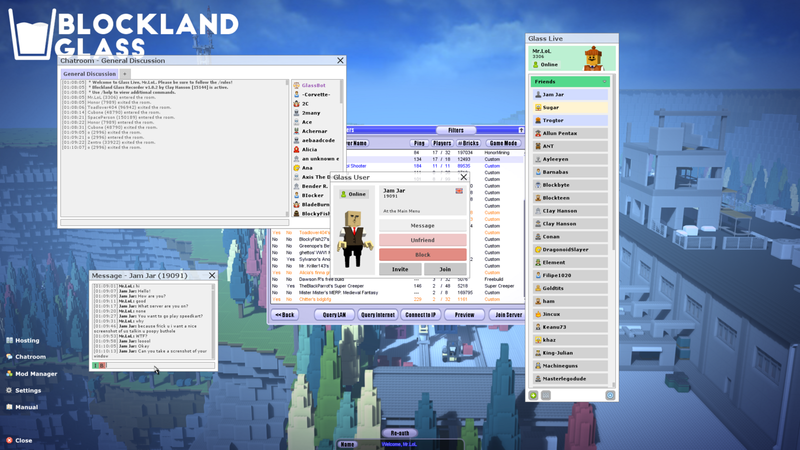 If you upload your mod to the blockland glass system, it will handle automatic updates just like rtb. The system has a handful of moderators and reviewers who all have access to a list of new add-ons and the ability to move them. Files are automatically checked. I do have some restructuring planned for the future, however. Yep, updates will be automatically pushed to anyone who got your vehicle through either the in-game downloader or the website. Updates can still be done without Glass installed, assuming that the users have Greek2Me's Support_Updater installed. Okay! I'll have to give it a shot in the future and see how it goes. Guess I don't have to now. Go to blocklandglass.com, make an account or sign in, go to "My Add-Ons", and you should find an upload button. Your mod is creating GuiProgressCtrls as seperate GUIs. You need to advertise this a bit more so it actually gets used. This sounds really promising. Hope this develops more and becomes better.